Who doesn't love fried chicken? 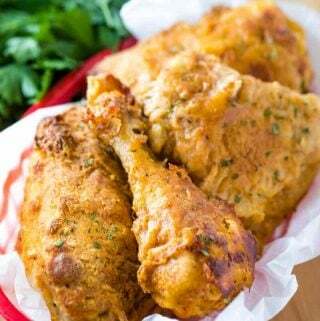 How about a slightly healthier version with this easy Oven Fried Chicken recipe! You'll never go back! In large baking dish add your butter and place in preheated oven to melt. Meanwhile in large bowl whisk together your eggs, milk and hot sauce, set aside. In another bowl whisk together your flour and seasonings until combined. Dip your chicken pieces into flour, then egg mixture then back into flour again and then place skin side down in your baking dish. Bake in oven for 30 minutes then flip chicken over and continue baking for an additional 20 minutes until brown and chicken is cooked through. Remove from oven and let drain slightly on paper towels. Sprinkle with chopped parsley before serving if desired.